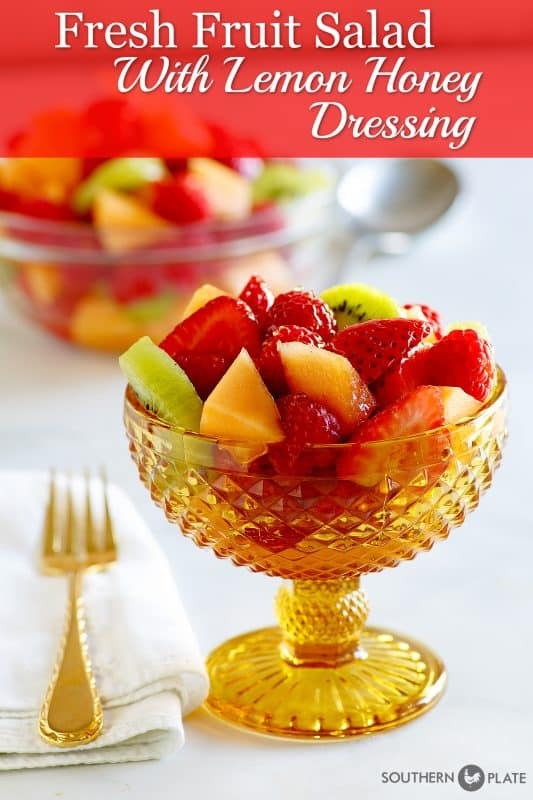 This Fresh Fruit Salad with Lemon Honey Dressing makes any day special! So often I’ll go to get groceries and I mentally go down my list, trying to pick out treats and favorites for each member of my family. Katy loves cantaloupe, Ricky has this certain peanut butter he likes, and they both eat more bananas than a band of monkeys. I make sure I grab all of those because I love seeing the delight on their faces that a little gesture like that can bring. Well, this past week I decided it was time to treat myself and so I took a little grocery trip determined to buy my favorites. I was a little surprised at what I ended up with! Blackberries, blueberries, watermelon, fresh pineapple, and a more oranges than I care to admit. Note to anyone who doesn’t know me in real, everyday life: I have a bit of an orange addiction but I totally own it. Oranges are like eating sunshine to me and so I have a couple everyday. We have always loved fresh fruit but I think the winter months that drag on a bit (as February tends to do) make it feel like even more of a treat. So today I’m sharing a simple but sparklingly flavorful salad with you that has a light honey lemon dressing which just brightens those flavors even more. This is a perfect treat for that special person in your life. But keep in mind that you are a special person in your life, too! It’s also makes a beautiful dish for bridal showers, baby showers, or luncheons. You can easily use whatever fruit you prefer or have on hand. And you know what? You deserve a special treat! 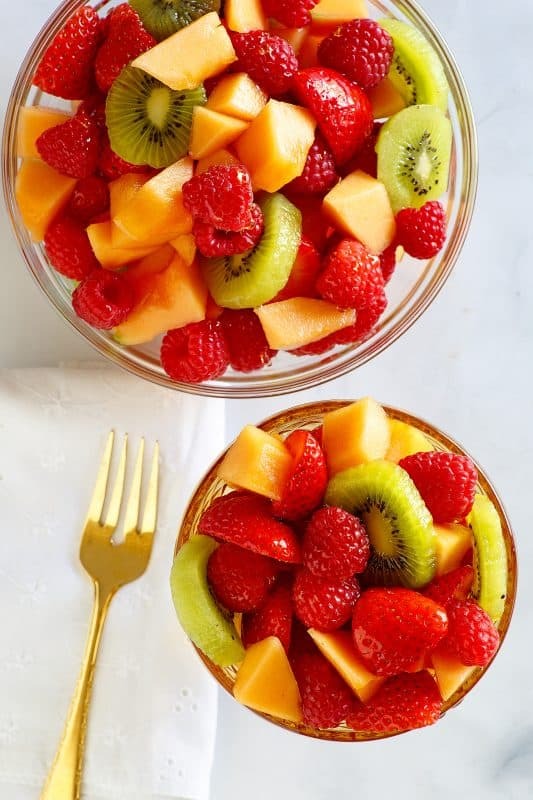 Any fruit goes in this salad! If you are adding apples and bananas, make sure they get well coated in the dressing because that will keep them from browning. I usually dice those up in a bowl first, pour the dressing over it, give it a good stir, then add the rest of my fruit just to make sure they are taken care of. The dressing is simply a matter of stirring together fresh or bottled lemon juice, honey, and a bit of cinnamon! Beyond that, all that is left is to cut your fruit. You’ll be amazed at how beautifully that little bit of cinnamon compliments everything. Wash and slice fruit if needed. Drain and place in large bowl. Stir well to combine. In small bowl, whisk together honey, cinnamon, and lemon juice until well blended. Pour over fruit and toss to coat. Chill for a few hours and stir again before serving. Solitude with God repairs the damage done by the fret and noise and clamor of the world. Not a big fan of cinnamon so would a couple of drops of almond extract work equally as well? Otherwise this fruit salad sounds amazing and want to try it soon. This would be an excellent treat to covered dish suppers. Absolutely! I would love for you to customize it to suit your taste and that sounds like a great idea! I have made many a fruit salad in my day (50 years of cooking!) and this really has become a favorite. In particular the honey lemon dressing. So light and refreshing. I took it to my daughter’s mother in law’s for a barbecue and it was devoured quickly! Have made it a couple of times. Young granddaughter is allergic to strawberries (!) so I just made a bowl to set alongside for others if they wanted them. A definite keeper to “hand down”!! I’ll have to make this for my family soon!! Just the sort of sunshine we could use during these dreary days of winter…all rain and snow! Amen Sister!! 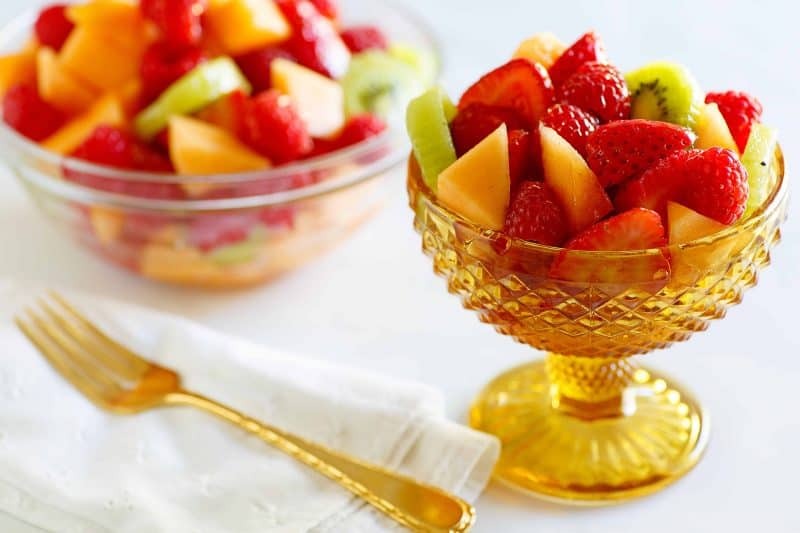 I hope you enjoy the fruit salad and stay warm! !